The following list is a modest beginning for a list of Frank instruments. For more information, go to the Detailed Record of Frank Instruments. This page lists known and reported Frank Instruments as a service to those researching Frank. 1942 - 1945 1000 - ?? There are many unanswered questions about the Frank serial number sequence(s). Were there multiple sequences for different instruments? Were sequences reliably chronological? Were the sequences reset when the factory moved to Barrington Ill, etc. US Army documentation (4) could explain why there appears to be no early documented horns from Wm Frank Co, even though he was in business from 1909. According to the army's own figures, 143,000 instruments were purchased. With figures like that, Frank's small company could easily have been busy filling military orders for years. The "established" 1938 end of first run of Frank horns (based on the above SN list) makes sense for two reasons: first, there was a recession in 37-38 that caught a number of businesses (York ceased production of saxophones around this time). The name "classic" appears to have been discontinued at this time. (Simlar to Martin who discontinued "handcraft" after WWII.) "National" and "Artist" apprear to have been initiated in 1945. Plus, the Barrington plant opened in this time, too. From the Middle Horn Leader website(5): "There's evidence that sometime during, or shortly after 1927, William F. Ludwig contracted the William Frank Company of Chicago to fabricate an instrument with the piston positioned horizontally instead of vertically." That appears to be the FIRST bugle off the assembly line!!! 1927 makes sense historically, too, since the serial numbers needed to begin before 1932, the year of Frank's death AND likely prior to the crash of 1929. He wouldn't be starting a new business initatives in the depression. 1927 was still a boom time, although some were beginning to see signs. . .
Martin made stencil saxes for Frank in 20s/30s, and All Experts mentions one with SN - 188255(6). It would also explain a martin SN as opposed to Frank - probably a special order. Another saxophone, 5,7xx, recently on eBay(7), which is clearly pre-1933. If the sequence starts in 1927, then 5,700 instruments by 1932 makes sense with a staff of 32 (fewer workers in the 1930s). This appears to be an actual Frank SN. 1. 1923-1927� William Phillip Frank (Principal 1923-1927) horn 1901-1932 the year of his death. Born January 1, 1876 in Allentown, Pennsylvania of German parents, William Frank first went to work for He first worked for Frank Holton & Co in Wisconsin, where he learned the specialty of high quality manufacture of brass instruments.� In 1910, William Frank established his own brass instrument manufacturing business in Chicago.� The William Frank and Company became a well-known manufacturer of brass instruments, including French horns, trumpets, trombones and later other instruments such as Saxophones.� William Frank died in Chicago in 1932. CHICAGO, ILL. June 16.�The William Frank Co., brass band instrument manufacturers, removed to the new factory at 2033 Clybourn Avenue, Chicago, last week, and the plant is already operating at top speed. William Frank, president and general manager of the company, stated to THE MUSIC TRADES that the factory is crowded with business, and that the demand for the different instruments used by bands is growing steadily. There was a special branch of the Quartermaster Corps which concerned itself exclusively with the musical requirements of the Army. This branch bought, in all, approximately 143,000 musical instruments. These were secured at a savings of about $500,000 under the prices which the Government had been paying prior to the war. Without going into the details of how this economy was effected, one typical instance may be cited. 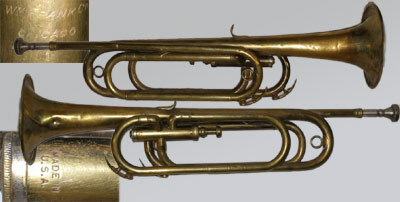 For years it had been the custom of manufacturers of musical instruments to embellish the trumpets and brass horns of bandsmen with engravings, chasings, and other markings. These were decorative only and had nothing to do with the quality of the tone produced. By eliminating all such markings from the specifications, a substantial saving in cost was attained. Chicago, IL. 1910-p1950. 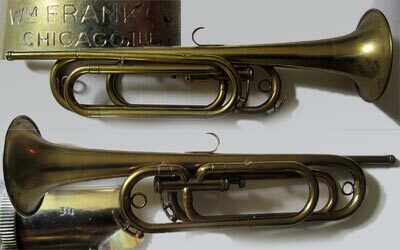 W. Frank initially worked for "Holton," allegedly produced first valved bugle for "Ludwig" in 1927. Produced "G-D" piston bugles in soprano, tenor, and baritone voices that were featured in Buegeleisen and Jacobson catalog c1940.